A Kansas deer lease through Mid-America Hunting Association core advantage is it solves a common problem for where to hunt. All without a search effort. Our approach leaves hunters alone to scout then hunt with no need to coordinate with any landowner. Maximizing scouting and hunting time enhances success. No trophy talk here. 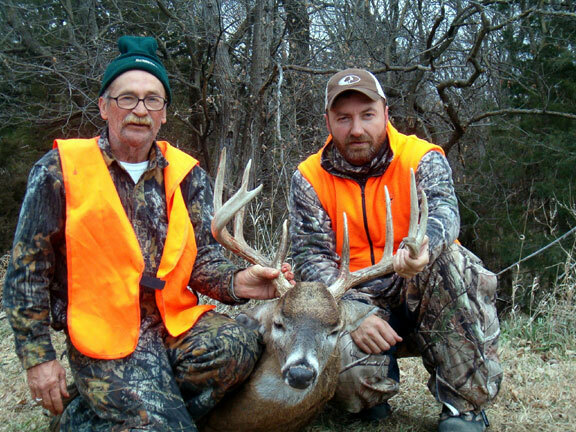 Just quality Kansas hunting available through a private Kansas deer lease without work of managing it. Remainder of our Kansas lease article is a dry assessment. Those seriously considering applying for a slot will find it informative. Others will not finish reading it. One advantage is we have is we do not operate a hunting lodge. Therefore, not limited to driving distance around any lodge for Kansas hunting lease land. We have all of Kansas available for where to lease land. When it does come time to spend money on land we do so where a good return for hunters is gained. A means to reduce where in Kansas the better deer hunting will be found. Lease benefits continue when once in a productive Kansas region we have multiple leases. Advantage to hunters is choice from day to day of where to deer hunt. Each hunter may have stands on several leases watching weather and rut for where to be any given day. Most will find Association private deer lease spots aplenty within driving distance from one lodging point. Hunting buddies of less than three in most cases will be able to hunt from one vehicle even if hunting two different lease spots. Groups larger than four should probably consider two vehicles. Two vehicles are not required by lease location not being in proximity well enough for four hunters. Reality is hunters will never agree on one spot. Late January during, height of Kansas winter. Limited snow. Large body bucks making racks look smaller than they score. 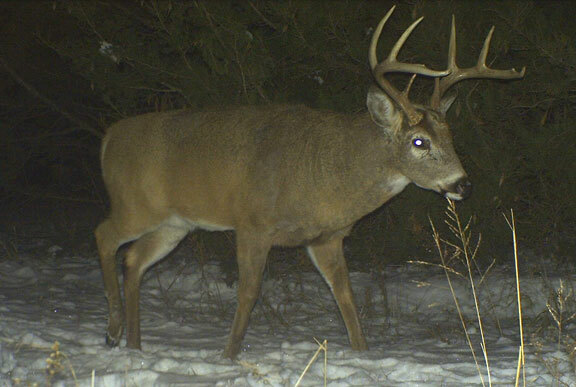 Our camera surveys seem to show a majority of good bucks die of old age. Our Association has been in business since 1965. We know full well what all who hunt Kansas desire, deer hunting spots. We make several Kansas deer lease spots available to all. Contrasting our several spots to a single large contiguous lease within grain farming regions of better whitetail production will show further advantage. Kansas rural acreage within grain farming regions runs a range of 80 to tens of thousands of acres. Not all Kansas farms are owned by farmers. 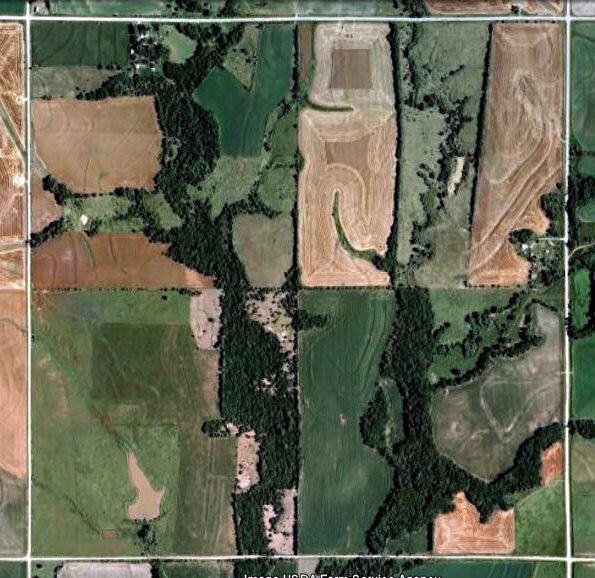 Much Kansas land is investment group owned with much acreage widely spread. Much more is large corporate farming operations of tens of thousands of acres. Our Kansas rural road system is laid out in one mile grids making a common large acreage piece being a one mile square. Amounting to 640 acres. Better hunting is within grain farming regions found in watersheds. These waterways and road system further break acreage down into small pieces. A compartmentalization that makes for deer huntable spots versus just acreage. Having just a spot to hunt is possible. Its problem is it is just one choice. Kansas regional differences vary widely by terrain. Different hunters enjoying one type of terrain over another may accommodate their specific preferences. With our Kansas deer leases covering multiple Kansas deer management units there is a choice of terrain for most. Bow friendly or gun advantage terrain are both available. Scouting may be done before tag application to define what Kansas deer unit the hunter would most like to apply for. All aspects hard to accomplish with a single deer lease in a single Kansas deer unit. Hunters will immediately assess such an aerial typically picking a best lease as one with many trees. Any one quarter section shown above, regardless of tree acreage, is a prime spot. Prime due to: Concealment from human observation. A year round water source. Food with adjoining cover. Getting over any ego requirement of gaining a large acreage lease is easy. It comes down to money. Average hunters with a middle class income may afford a lease cost of up to a half section, 320 acres. Once anyone realizes lease money does not go far when measured in acreage smaller spots become more attractive. Regardless of total acreage it does come down to all are hunting small spots one at a time. An understanding develops making it easier to examine our deer lease approach. Through our Association that each Kansas hunter has more small spots to scout then hunt over a larger area making for more chances to get on a good buck than by placing all hopes into just one small acreage deer lease. This aerial is a one mile square. Bound by one mile grid road system. This is common to Kansas. Composed of four equally divided quarters (160 acres each at 1/2 by 1/2 mile square). Each quarter is a different landowner. A split wooded drainage's further compartmentalize its food/cover. It all comes down to when deer hunting, all will be hunting small isolated spots regardless of total lease acreage available. 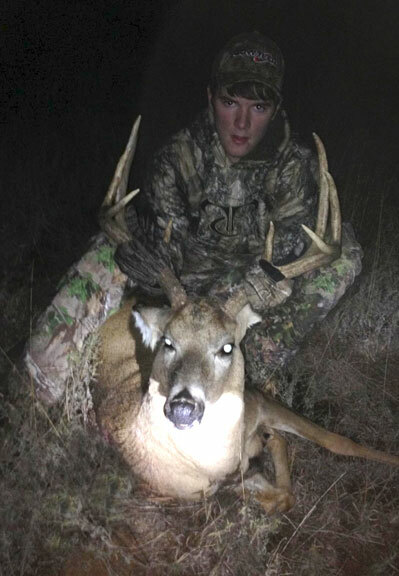 “…father-in-law’s personal best…” On his first hunt. An immediate counter argument to our Kansas deer lease particulars described above will be those who will find large contiguous acreage leases available not broken by roads. A real possibility for anyone who looks. What is also true is less roads means poorer Kansas deer hunting. Kansas hill country of poor soil with large expanses of pasture. Or, larger contiguous acreage unbroken by one mile road systems. This livestock farming use has less food and a lower deer herd density. It is also true grain farming regions of better food sources have a greater deer herd density and more roads. These regions are also within watersheds of higher soil quality. Watershed are what brings grass, brush and wooded, cover, drainage’s cutting through deer food source grain fields. Or, non-plowable ground. Most connecting small mixed wood, bush and grass patches. More food, more cover means more chances for success. These are regions of increased deer lease competition. Roads reflect when Kansas was mostly territorial. Original Kansas land grants to those willing to farm was one mile squares. Acreage considered farmable by a single family. Farmers back then made money in grain, not cattle as is true today. Those one mile square sections of 640 acres have since been sold off in uniform half sections, quarter sections and down to 80 acres pieces. A most commonly bought/sold piece being a quarter section. A resulting local colloquialism is most farmers speak in terms of quarters farmed rather than acres. A Kansas hunting lease by us does not fit all. There are always consequences of any choice to examine. By comparison of consequences to see if benefits offer sufficient value to make any choice a better decision. There must be controls to limit pressure. These controls some folks identify as deal breakers before thoroughly discovering their advantages. First of these controls bringing a bit of concern is limited access. While controlled access may be seen as a detractor, pressure management is key to good hunts. Contrast this with a private lease with no one watching and it’s doubtful that lease is as private as desired. Or, an outfitter who cycles one hunt clients through as quick as possible to boost his bottom line. No one lease is dedicated to one hunter. A financial impossibility. One technique for successful hunts is to seek a buck of choice. Not hunt terrain features. Defined as each hunter may scout much acreage then hunt several spots. A method to increases opportunity to get on a buck of choice. A difference is he is more likely to find a good buck on several disconnected pieces than on any one contiguous larger acreage lease. An illustration of our covering ground approach in practice is most Association deer hunters have three to five leases they consider first choice deer spots. Average size per spot is 160 acres. A range of 480 to 800 acres (160 acres times 3 or 5 spots). Why acreage is important is having a combination of doe holding, food source, protective cover and water source terrain do not frequently combine on any one given spot. Or, more likely to occur/combine over several spots. Using the lower acreage amount of 480 acres if acquired at $5 dollars an acre gives a low side cost of $2,400. Not a bad price if paying just $5 per acre. High side using 800 acre amount costs goes up to $4,000, again if getting by at $5/acre. A financial impossibility for most is how much money is required to get deer cover/food acreage. To have 400 to 800 acres being of huntable land. Meaning deer holding food/cover, within Kansas’ agricultural grain farming region is recognition of farming use is 45% to 55% of all farmland. This requires twice that huntable acreage in a deer lease to get a minimal amount of wildlife acres. Or, 960 to 1,600 gross acres to net enough to actually hunt. A cost driver reaching to $4,800 to $8,000 a year. At cost likely out of reach of most average deer hunters. Average deer hunters are who we work with. 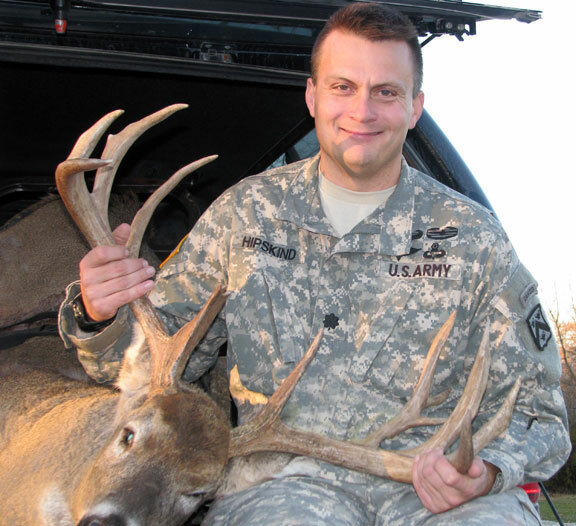 Average deer hunters are best suited for self guided deer hunts. Any hunter that can afford an $8,000 dollar hunt wants more than private deer hunting land access. Or, what we do not provide. A 960 to 1,600 acreage contiguous lease is hard to find within gain farming regions found in watersheds further broken by 1 mile grid road system. Additive is the most frequently sold/bought piece of real-estate is a quarter section, or 160 acres further divides farms. To find even a full Kansas section at 1 mile square to lease is tough to do. What occurs to many after some time looking is they will be leasing quarter(s), half sections or if lucky a three quarter section. Deer hunter then finds themselves back to hunting small spots. Through us, hunter have several small spots. Having several means a greater likelihood of getting a combination of water, food, protective cover habitat to where trophy’s wants to be. Other Association limiting factors should require little explanation to how they limit pressure concurrent to increasing hunt quality. First of these is no camping. Ground that sees little human presence any time will be changed dramatically by a sudden 24 hour human presence. All wildlife would be on notice. More core to our Association’s value is our product is hunting land. Not campgrounds. There are other practical considerations about camping. First is a water source. Water is rare often not available at a primitive camp site. Any deer hunter not prepared to control his scent during a deer hunt we are less inclined to work with. A list of campgrounds is on the web site. At campgrounds is where reliable water will be available. We do encourage anyone hunting more than a week to bring a camper. Its real value is being able to cook preferred meals. Many good deer regions have limited restaurants. Many restaurants do exist having limited menus. This is a case of where fresh or canned fruit along with vegetables are of added value. Next, no drive, gang or party hunts. We consider deer drives low life hunting. It does more damage than good. Association hunters that stand hunt have been ones who consistently produce recurring success. No guests. A matter of Association integrity that only those who have paid for Kansas land have access to it. No one gets for free what others have paid for. No off road vehicle use. Foot scouting, stand placement/takedown and deer hunting only. Any off-road vehicle presence will place much pressure reducing hunt quality. Deer lease access is by reservation. All hunters kept separate. All acreage is found through an online map library. Each deer lease is numbered. Each hunter will make a reservation to a numbered lease for any days he wants to hunt. One numbered spot per hunter per reservation unless changed. And, it’s better than just not seeing another hunter. There is enough land there is no reason to fall in after another. We do not want hunters to be stepping over boot prints of another. We do not want stands to be seen at sunup.